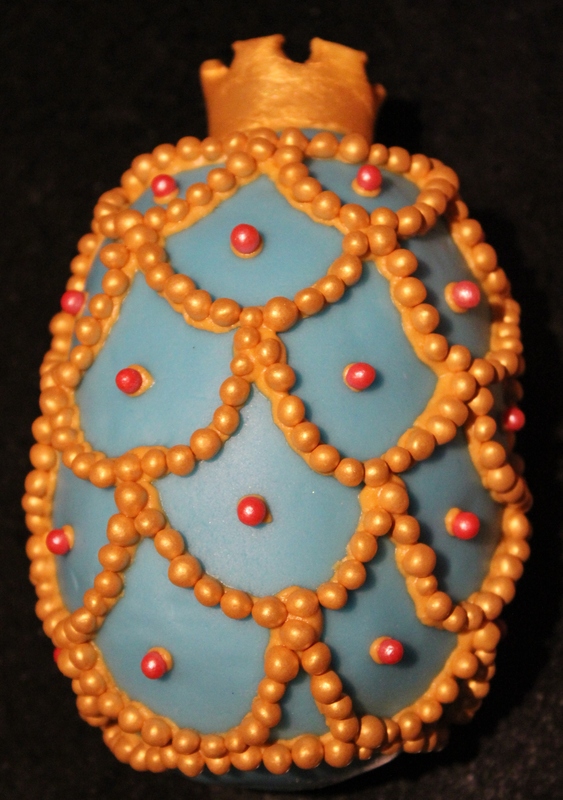 With Easter approaching I wanted to try some Faberge inspired egg cakes. I recently purchased a silicone cupcake sheets that bakes round cupcakes! 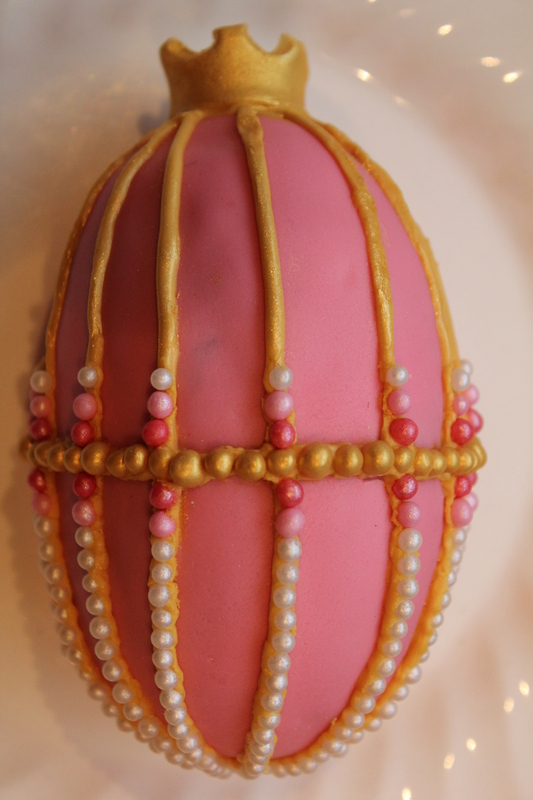 I thought this would be prefect for egg shaped cakes. 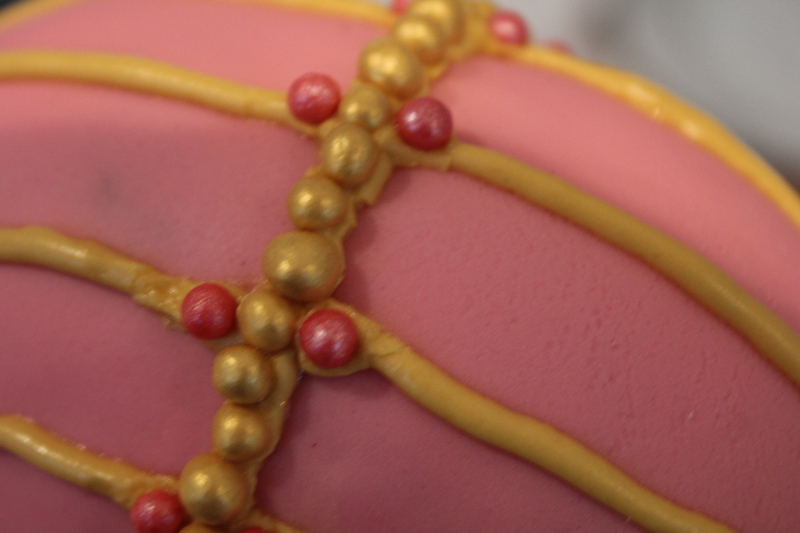 As I was going to cover these in coloured fondant, I thought a denser cake texture would be ideal. So I settled on a good old fashioned pound cake recipe that I had used before. I think they turned out pretty well. 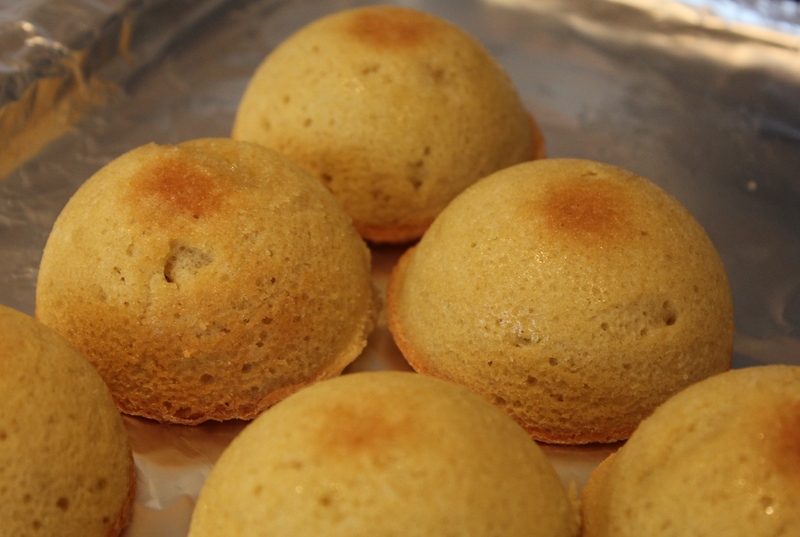 These were baked in a round cupcake silicon mold which produced 6 little rounded cupcakes. I baked the rest in a loaf tin for the middle sections to elongate the egg shapes. You can use the recipe below for a 7 1/2 cup capacity loaf tin. OK. So now that they are egg shaped, I crumbed them with more butter frosting and put them in the fridge while I thought about the decorations, and prepared the colored fondant. 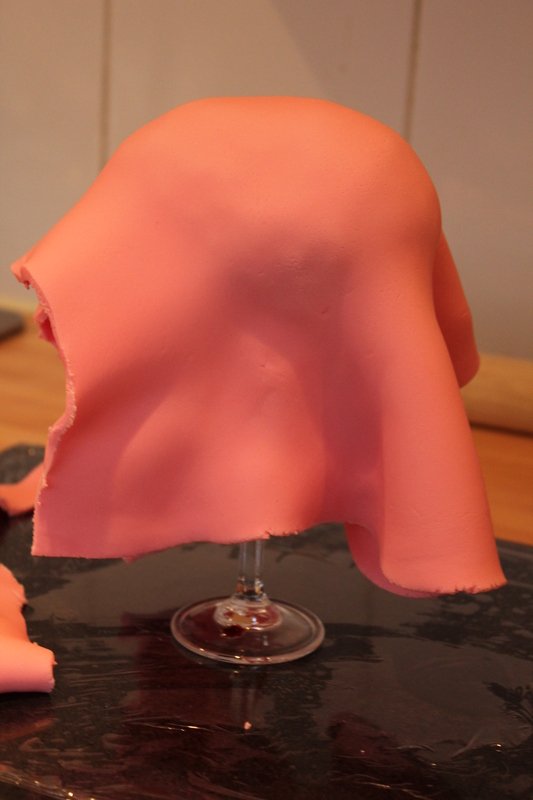 As you can see I used a fair bit of frosting in an attempt to even out the shape. 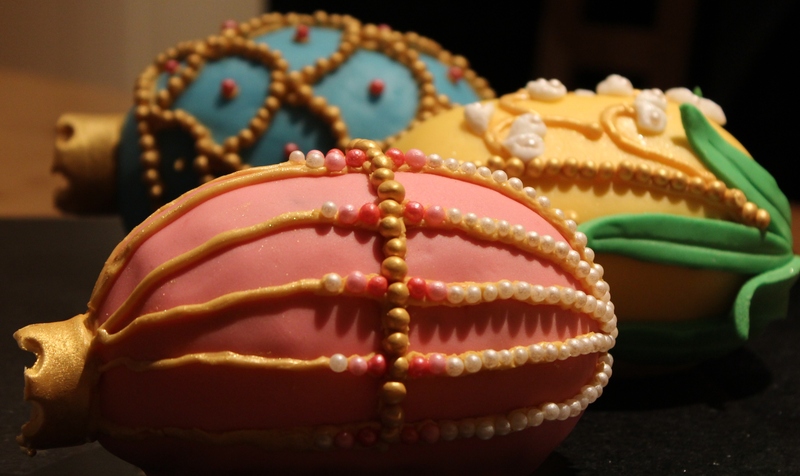 Next time I make these I will use an egg shaped mold for a more even finish! Once they were cold from the fridge, and the fondant had been colored (I use gel colors – much easier to knead in) they needed to be jammed so that the fondant has something to stick to. I zapped some black cherry jam in the microwave and covered the cakes. Phew! Now comes the piping. I made some gold piping frosting with a little yellow gel dye and some edible gold powder. I also collected lots of soft pearls (I don’t like the hard ones – too difficult to eat) and started decorating. 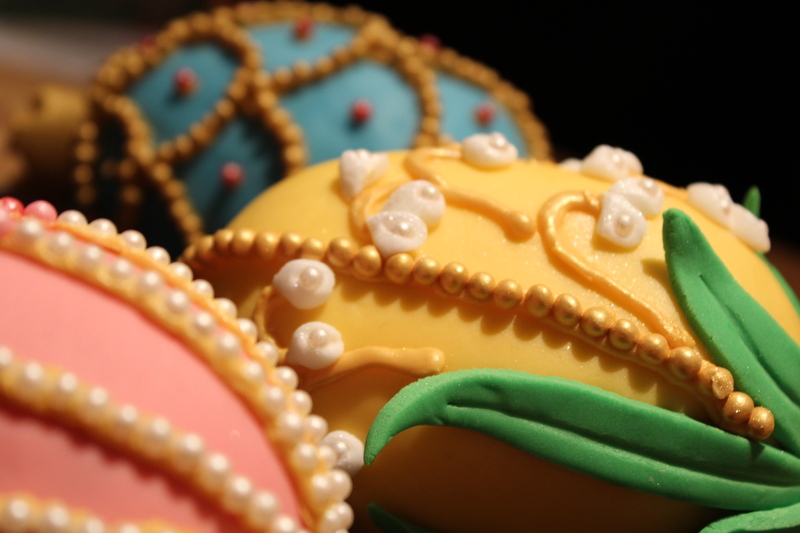 I followed exactly the same procedure for the blue and yellow Faberge egg cakes. 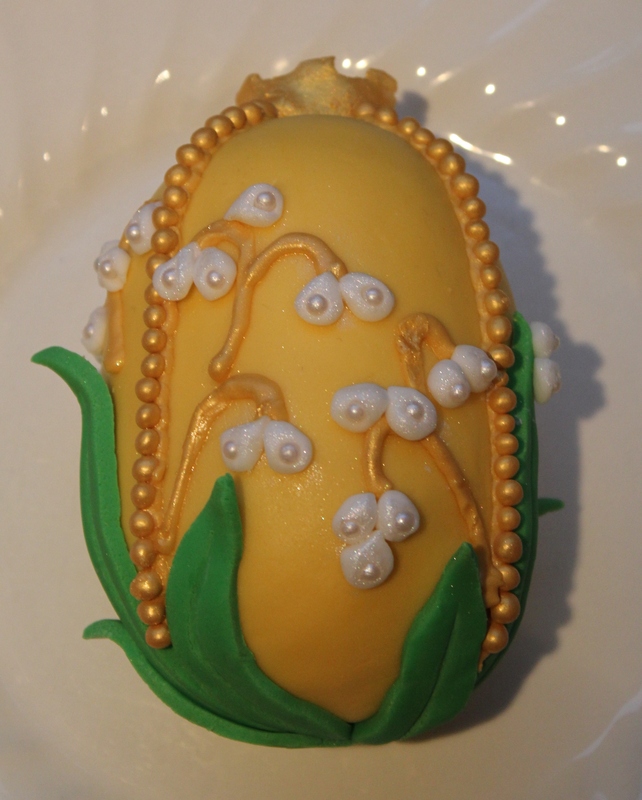 I think the yellow lily of the valley cake turned out the best. 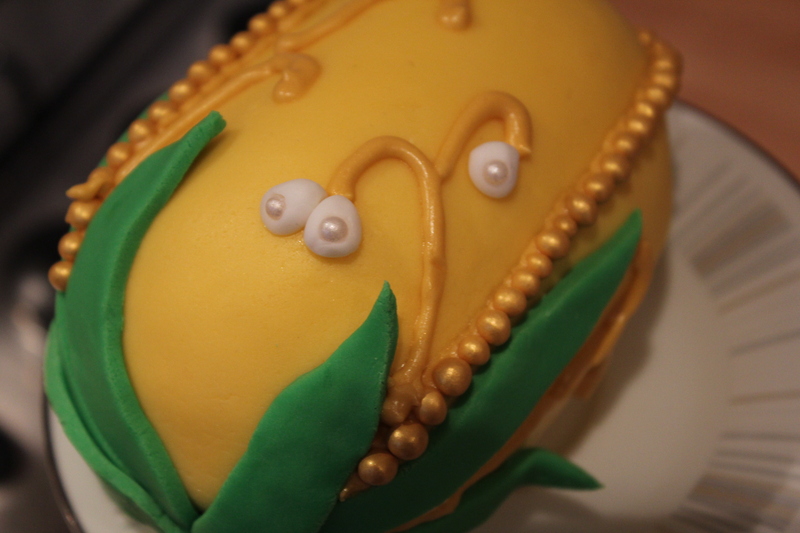 This was done by cutting out green fondant leaves, piping the gold stems and then creating the little lilies from small white fondant balls with a little soft white pearl. 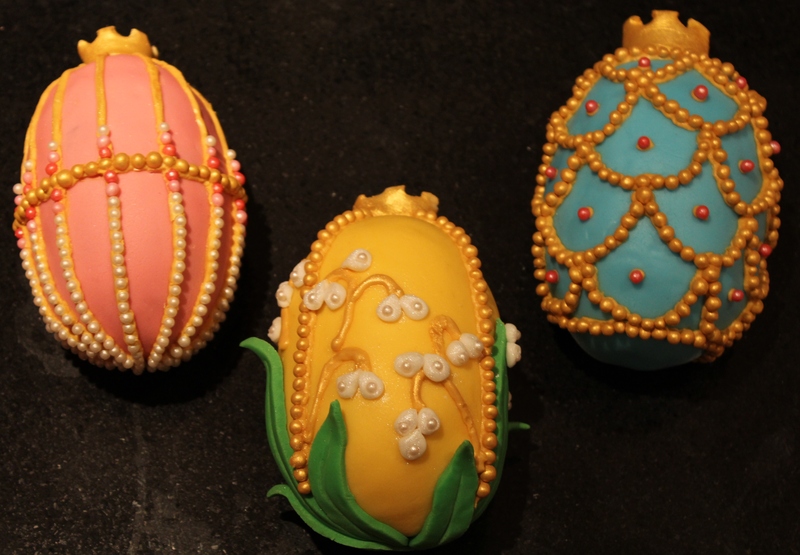 To finish them I made little crowns out of the fondant and sprayed them gold with edible gold spray. By this time I was pretty exhausted – the whole process for the decorating took about three hours. But in the end it was worth it. One cake should feed two people. 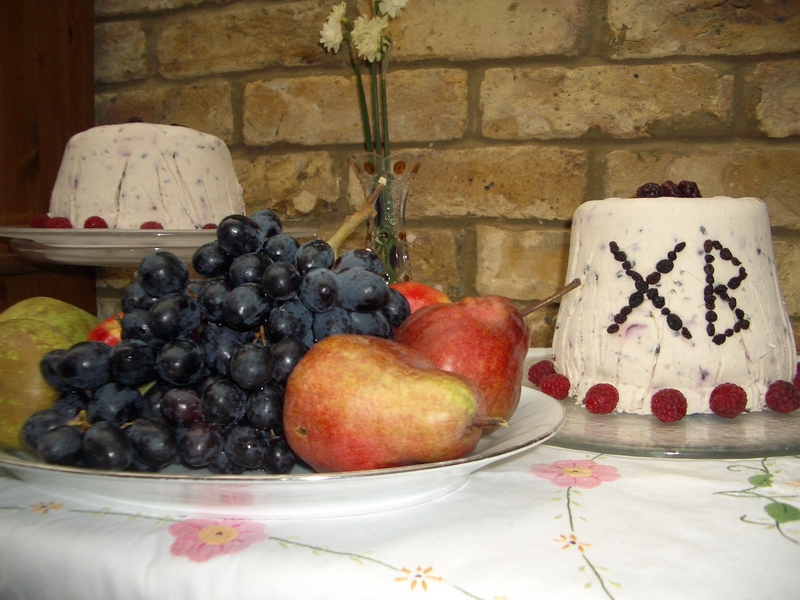 I served them up with cream – the pound cake was beautiful, light, but with good structure for this kind of decorating. 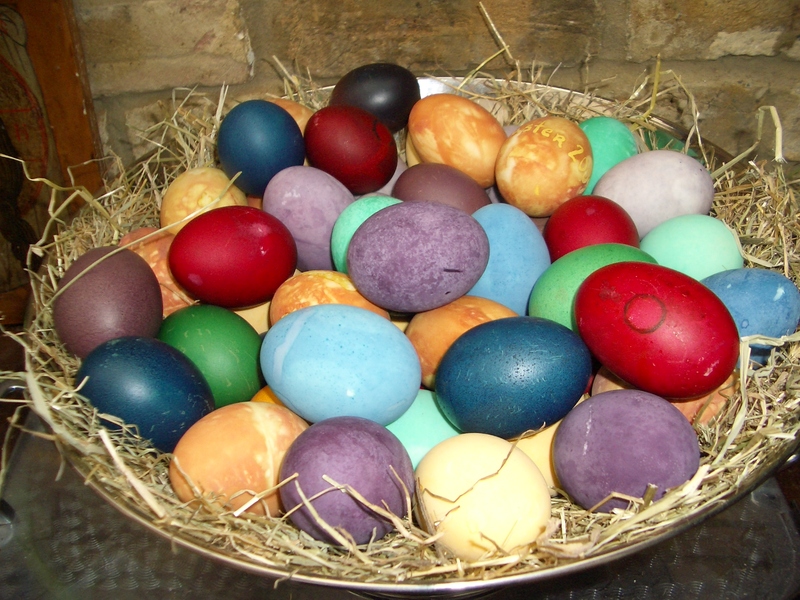 I think they would look amazing on an Easter buffet table! 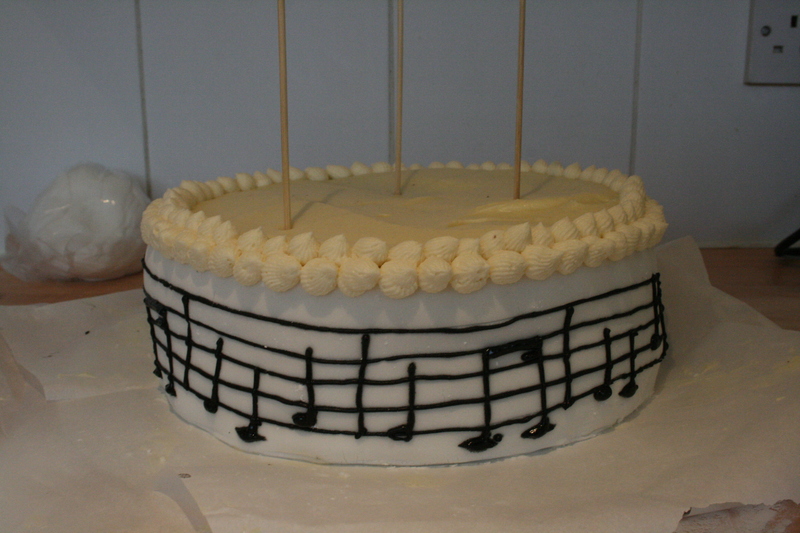 Not being particularly musical, I was pleased that the professional musicians who were at the party recognised it straight away. Here’s the recipe for the lovely fudge-y chocolate, moistest ever chocolate mud cake. 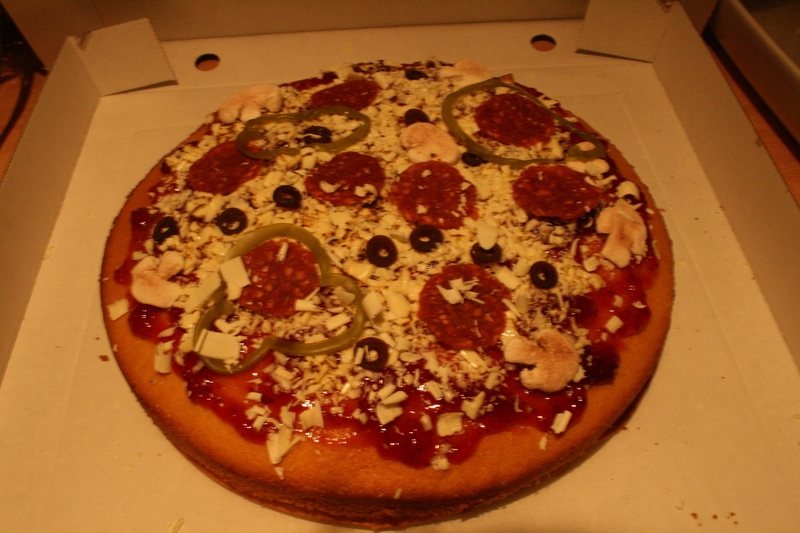 Quite some time ago a take-away food loving friend had a birthday, so naturally I made a pizza cake. He likes cake too, so that was all to the better. I wanted something naturally good tasting as well – which it was – fresh strawberries and cream sandwiched between two large, flat Victoria sponge layers. 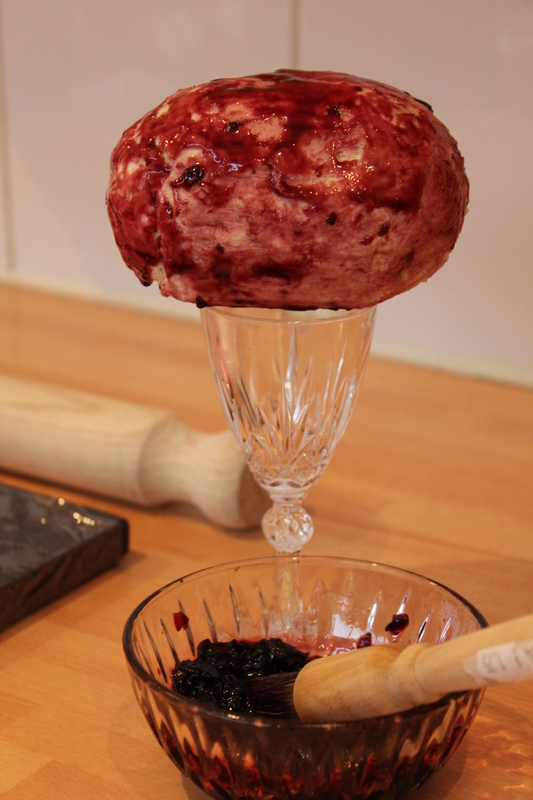 All the decorations are fruity – made from various fruit leathers, exept the marshmallow mushrooms. Strawberry jam and white chocolate shavings make up the tomato sauce and cheese! 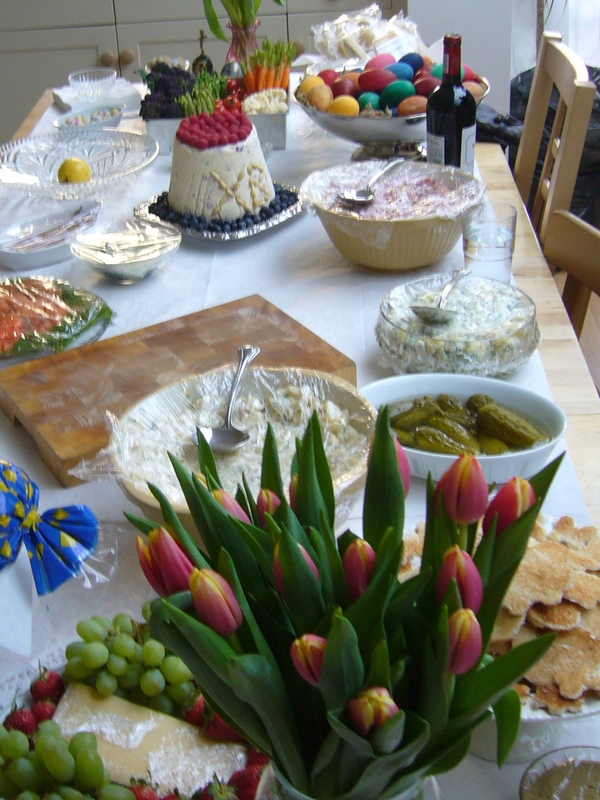 To construct the decorations, I hit up the local health food store, and supermarket and bought a wide variety of fruit leathers. Most were already flat, and some I rolled out even flatter. 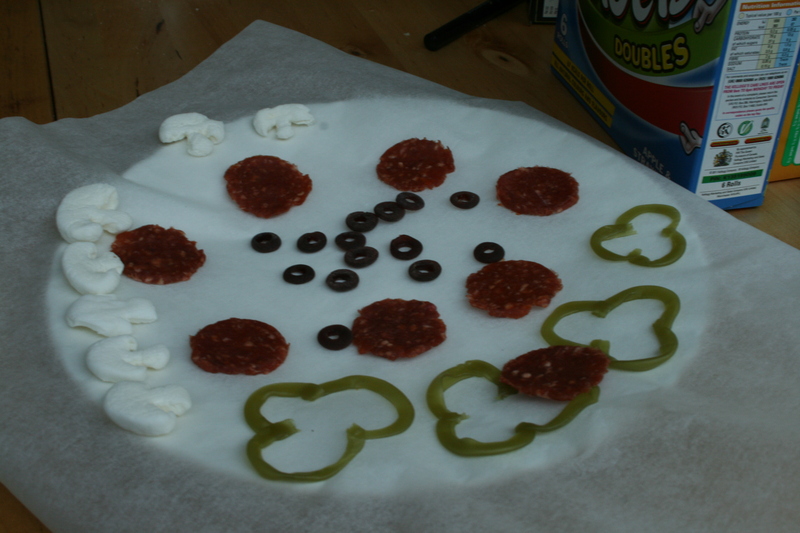 I cut out the pepperoni with a cookie cutter, and cut out the olives with a frosting piping nozzle – which worked for the hole in the olive as well. For the mushrooms I sliced marshmallows and cut shapes that vaguely resembled sliced mushrooms – then I brushed them with a little cocoa powder to turn them brown(ish). The peppers were made from long slices of green fruit leather, and shaped into pepper slices – you can see the joins in the picture above – the beauty of fruit leather is that it will stick to itself reasonably well – certainly well enough to hold its shape for a few hours on top of a cake. 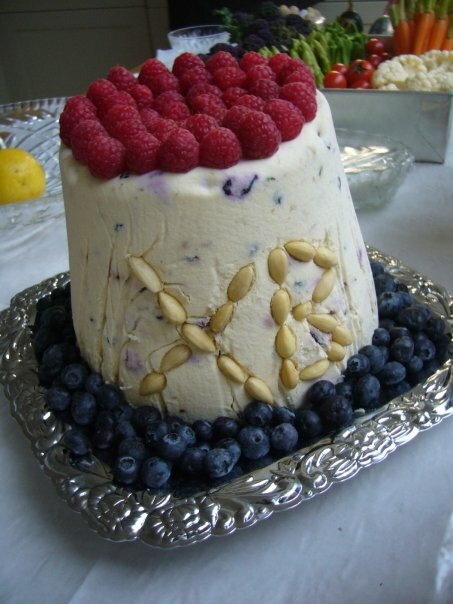 Once all the decorations were made, I topped the top cake layer with strawberry jam, and grated white chocolate over this for the cheese. Then I added the decorations, and finished the lot with a little more grated white chocolate. Then I used a brulee torch to melt and brown some of the chocolate for the final touch! It looked so authentic that it was hard to eat. My eyes said savory – my mouth said sweet! This version of the classic Victoria sponge also makes great cupcakes. The amount here can be easily halved to fill 2 x 6 inch sandwich tins. 1. Preheat oven to 180F/350C and prepare 2 x 10 or 11 inch sandwich tins with baking parchment. 2. Cream the butter and sugar very well, until pale and fluffy. 3. Add the beaten egg, a little at a time, and if mixture threatens to curdle, add a little of the flour (1-2 tablespoons), then add the vanilla. 5. Divide the mixture evenly between tins. 6. Bake sandwich tins for 25-30 mins, until well risen and a skewer comes away clean. Today is mother’s day in the UK and my mother requested apple pie to celebrate. 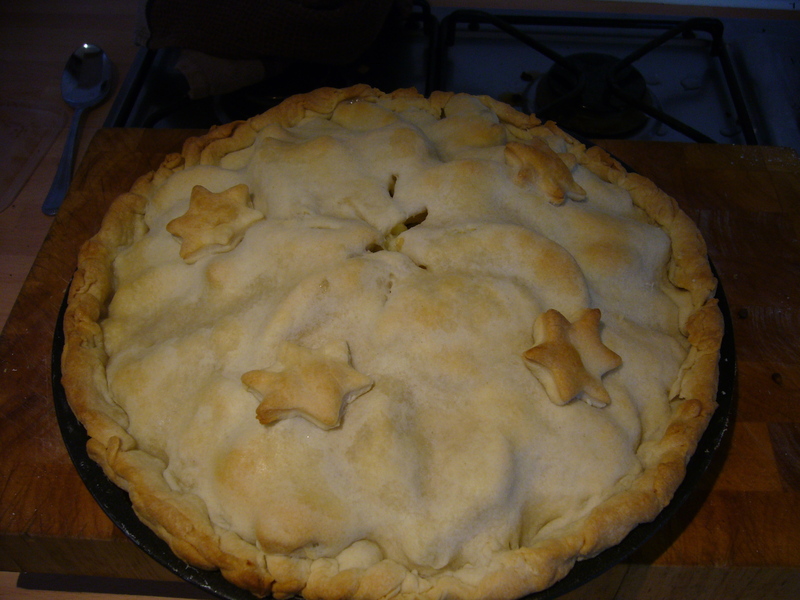 I have a very good, tried and true recipe based on the Martha Stewart recipe for mile high apple pie. If you don’t have time to make the pastry from scratch (although the recipe for pate brisee is very easy – only hot weather will scupper this) store bought shortcrust is a fine substitution. Bramley apples are my favorite to use, or Granny Smiths come a close second, but you do need to use a sharp, crisp cooking apple. 1. Place flour, salt, and sugar in the bowl of a food processor fitted with the metal blade; process until combined. Add the butter pieces; process until mixture resembles coarse meal, about 10 seconds. If you dont have a food processor – this can be done with hands. 2. Add the ice water in a slow, steady stream through the feed tube with the machine running, just until dough holds together. Do not process more than 30 seconds. 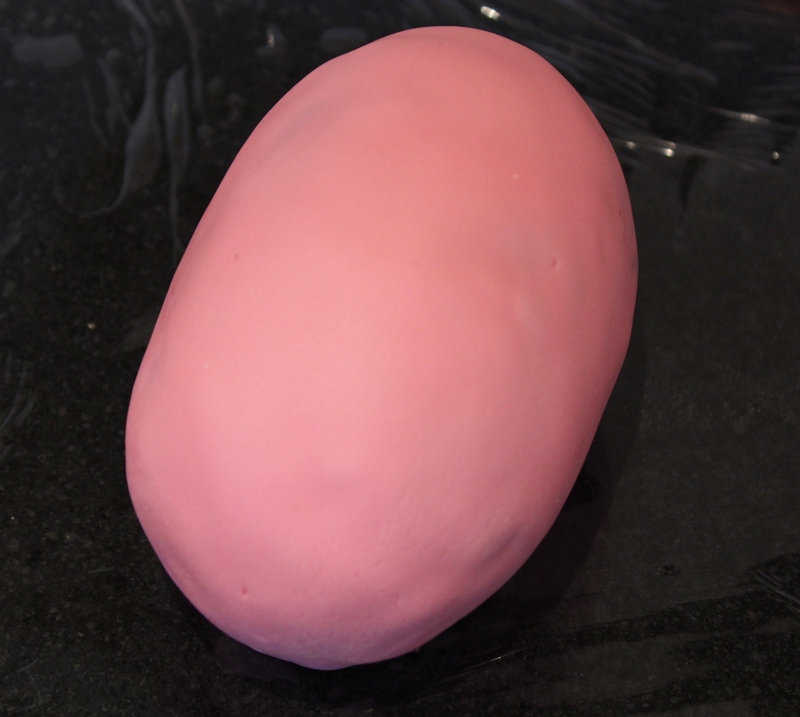 Test by squeezing dough; if it is still crumbly, add a bit more water. 3. 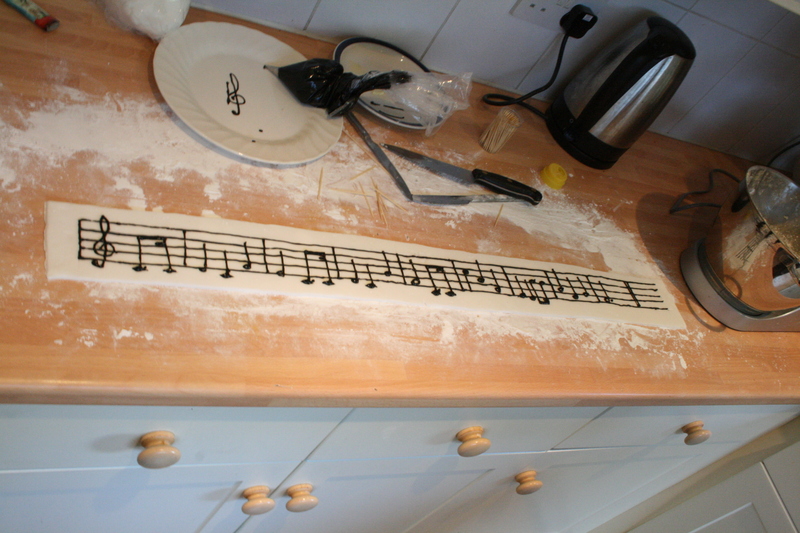 Turn the dough out onto a large piece of plastic wrap. Divide the dough in two pieces with one piece slightly larger than the other. Grasping the ends of the plastic wrap with your hands, press dough into a flat circle with your fists. This makes rolling easier than if the pastry is chilled as a ball. 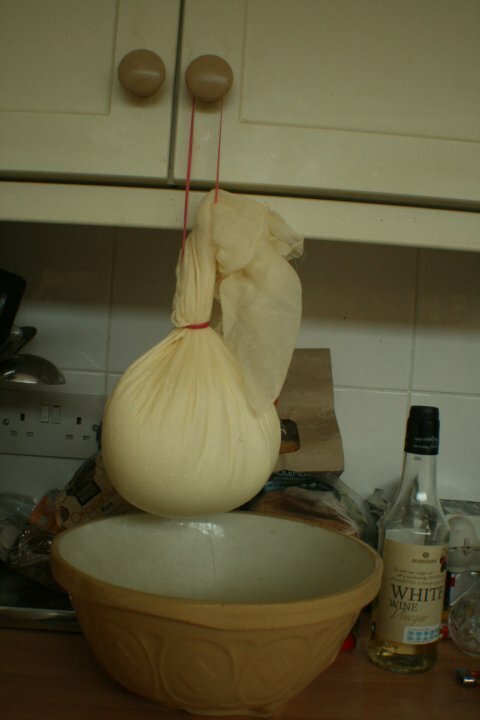 Wrap the dough in the plastic and chill for at least an hour. Easy! Like I said, the only way that this pastry recipe can be awkward, is if its a very hot day. In this case, don’t mix with your hands, definitely use the food processor and try to handle it as little as possible. Also, the time the pastry spends in the fridge can be lengthened. 5 1/2 pounds firm tart apples pref. 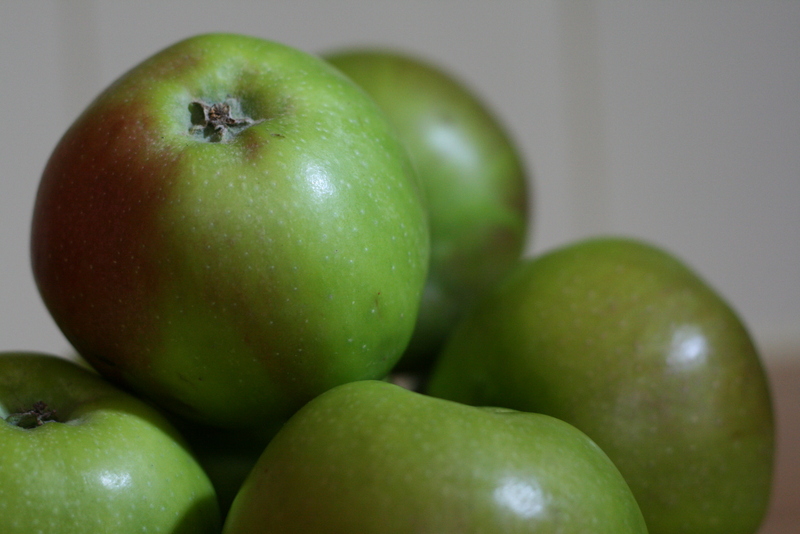 Bramley or Granny Smith. 1. Preheat oven to 230 degrees (yes, very hot). On a lightly floured work surface, roll out the smaller piece of pate brisee into a 15-inch round about 1/8-inch thick, dusting surface with flour to prevent sticking, as needed. Brush off excess flour. Roll dough around rolling pin, and place over a deep-dish 9-inch pie plate. Line plate with dough, pressing it into the corners. Trim dough to within 1 inch of the pie plate. 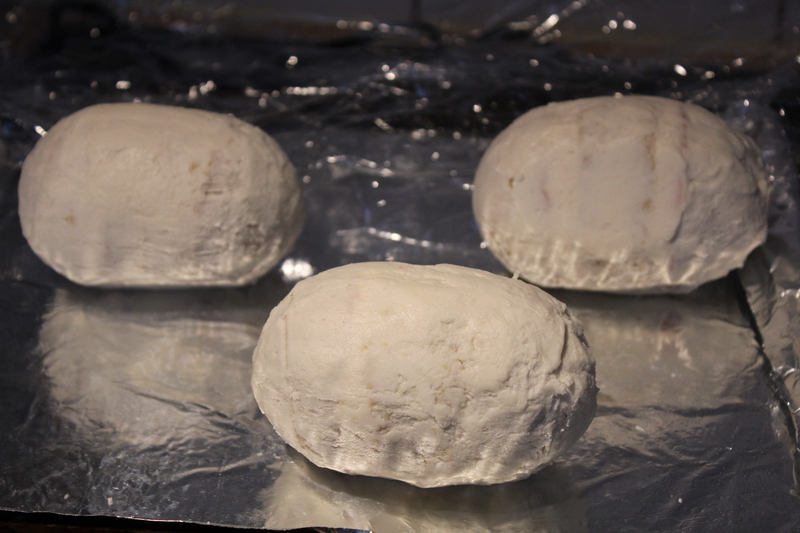 Cover with plastic wrap; refrigerate. 2. Roll out remaining piece of dough into an 18-inch round. Transfer round to a baking sheet; cover with plastic wrap, and refrigerate. 3. Peel and core apples, and cut into 1/4-inch-thick slices. Place slices in a large bowl; sprinkle with lemon juice to prevent discoloration. In a small bowl, combine flour, sugar, and cinnamon; toss with apple slices. 4. 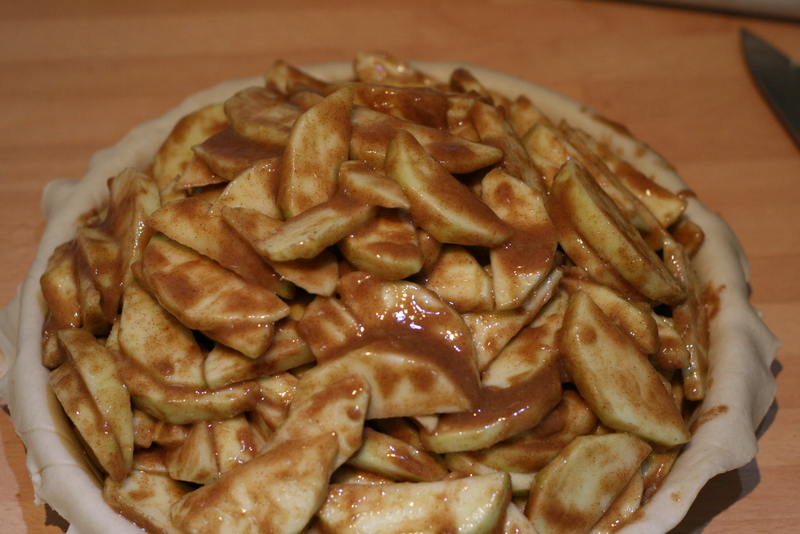 Remove remaining dough from refrigerator; place apple mixture into prepared pie plate, mounding it in a tall pile. Dot filling with butter. Place dough round over the apples. Tuck edge of top dough between edge of bottom dough and rim of pan. Using your fingers, gently press both layers of dough along the edge to seal, and crimp as desired. 5. Using a paring knife, cut several vents in top of dough to allow steam to escape. In a small bowl, whisk together egg yolk with 2 tablespoons water to make a glaze. Brush surface with egg glaze; sprinkle with sugar. Place on a baking sheet, this will catch any juices that may overflow during baking. Bake until crust is golden, about 15 minutes. 6. Reduce oven temperature to 180 degrees and continue baking until crust is golden brown and juices are bubbling, 45 to 50 minutes. Remove from oven, and let cool before serving. Here’s what the inside of the pie will look like – you can be neat or messy when stacking the apples, it all comes down to the time you have and how high you want your pie. 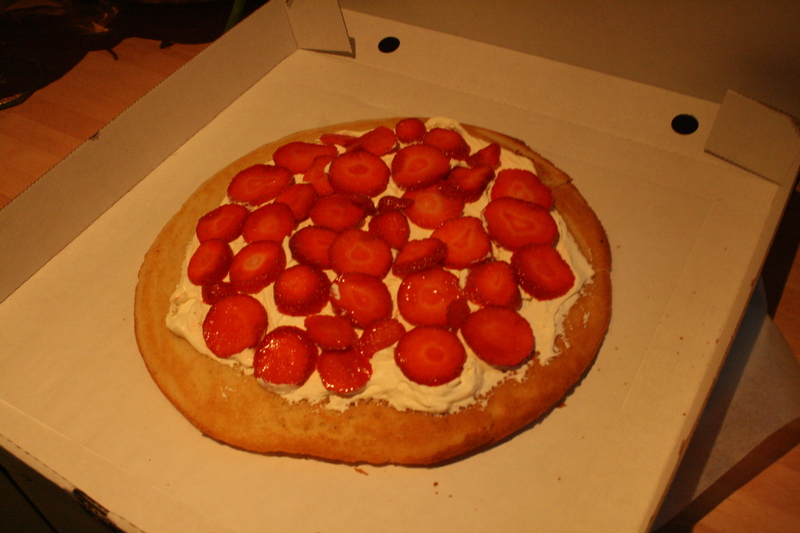 If you want to go as high as you can, it does help to place the slices more neatly. Yum! I like it still warm with vanilla ice-cream. Enjoy! So. 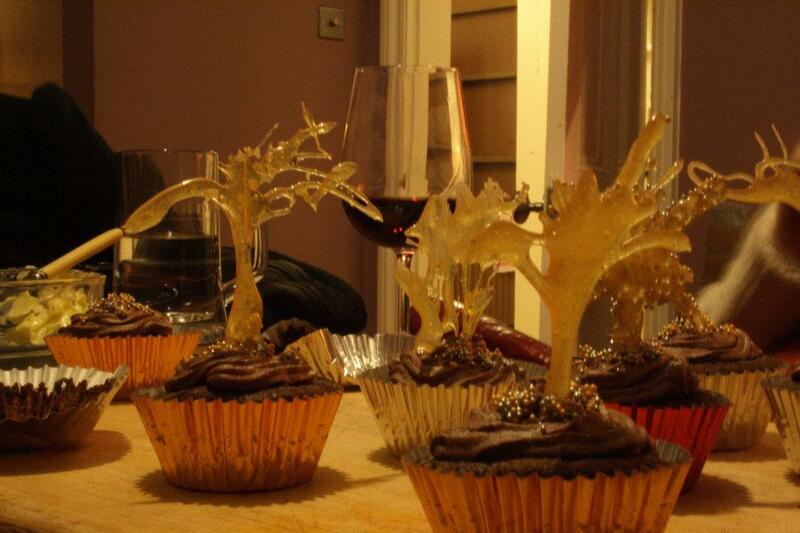 My latest challenge was to bake some cupcakes for a lovely friend’s party on Guy Fawkes night. I was toying between bonfire cupcakes and firework cupcakes and I wanted something to incorporate spun sugar or toffee decorations. 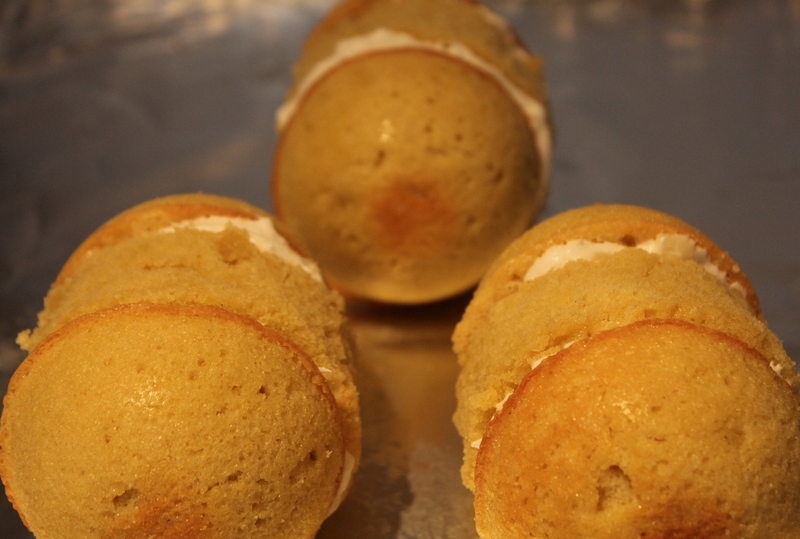 I also wanted something cheeky and surprising inside the cupcakes. 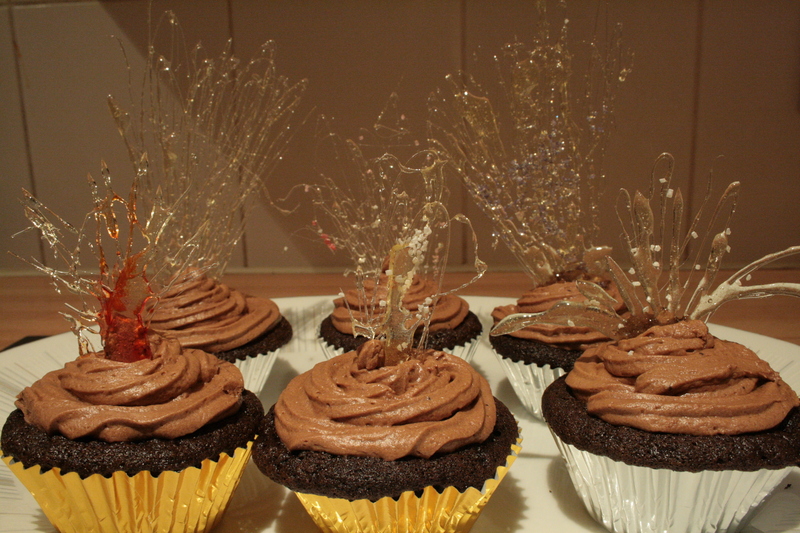 The conclusion I came to was chocolate fudge cupcakes, with salted dulche de leche in the middle, chocolate butter cream frosting and sugar firework decorations. The chocolate cupcake is the same recipe for the chocolate fudge cake last post, recipe here. Dulche de leche allegedly originated in Argentina in the early 1800’s, and is basically sweetened condensed milk, boiled down to a lovely thick caramel. I had always done this by piercing the tin of condensed milk, putting it in a pan of water and waiting hours and hours and hours until it was done. Recently, I found a Hairy Bikers’ recipe that cuts this time right down. Open the tin, pour into a shallow baking tray, cover with foil, put this into a larger tray of water (a bain marie) and into the oven at 220 degrees (centigrade), for one to two hours. When its thick and toffee coloured, whisk it together and its done. I love the unexpected zing of salt in the caramel – so I whisk some in when its cool – use good sea salt, I prefer Maldons. The spun sugar decorations were tricky. There is a very good tutorial by cooking4chumps here. Basically, take 140ml water, pour over 140g sugar in a pan, add some liquid glucose and heat. Make sure every single little molecule of sugar is dissolved in the water before it comes to the boil, or you risk crystallisation. Make sure everything you use is extremely clean (or you risk crystallisation). You want to bring it up to 160C – check with a candy thermometer. Do not let it get over 160 – or guess what – you risk crystallisation. A couple of drops of cold water can help to stop it continuing to heat up. 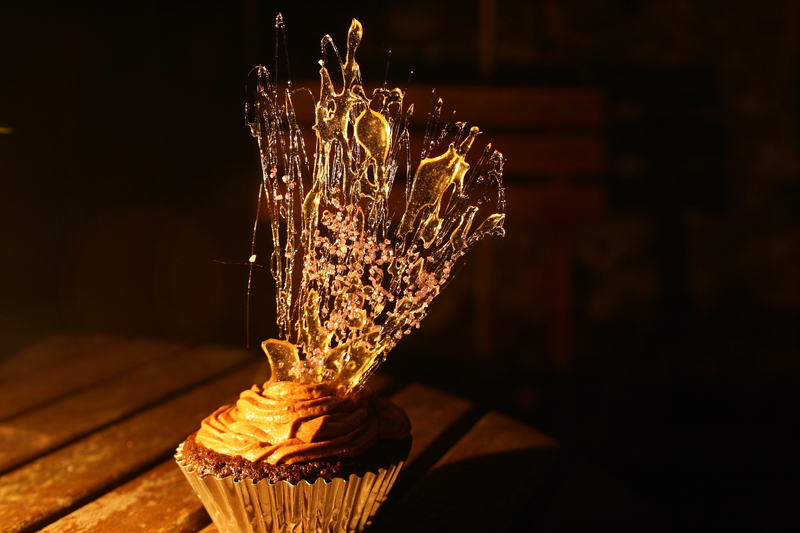 Then I simply took a spoon and made “firework shapes” on a piece of baking paper, and waited for them to cool. Some I sprinkled with glitter sugar sprinkles. 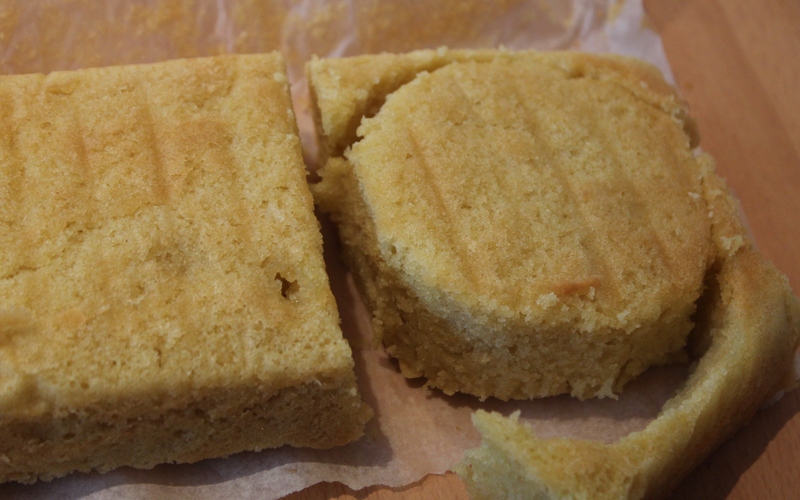 Once the cakes were baked and cool, I piped in the dulche de leche (or you can core them with a teaspoon and put a teaspoon of the caramel in the hole before putting the cake core back on top). Then I piped them with the butter cream frosting and carefully put the sugar fireworks on top. A couple of weeks later when I had to make them for real, I decided that I wanted to use pop rocks as well to give them even more of a zing. But pop rocks don’t pop if they have been wet at all – to use in cooking you have to coat them in melted chocolate first. I put some chocolate covered pop rocks under the dulche de leche in the cupcakes, and instead of butter cream I used a whipped ganache frosting. The sugar decorations didn’t turn out as well as the test batch (typical) nor did they travel as well as I’d have liked, but they sure did taste good!